Luckily, I had little Mia Davisson, Gari’s six-month-old niece and the daughter of Wesley and Fiona from the Snake Farm Zoo, as a stand in and she did a stand up job! 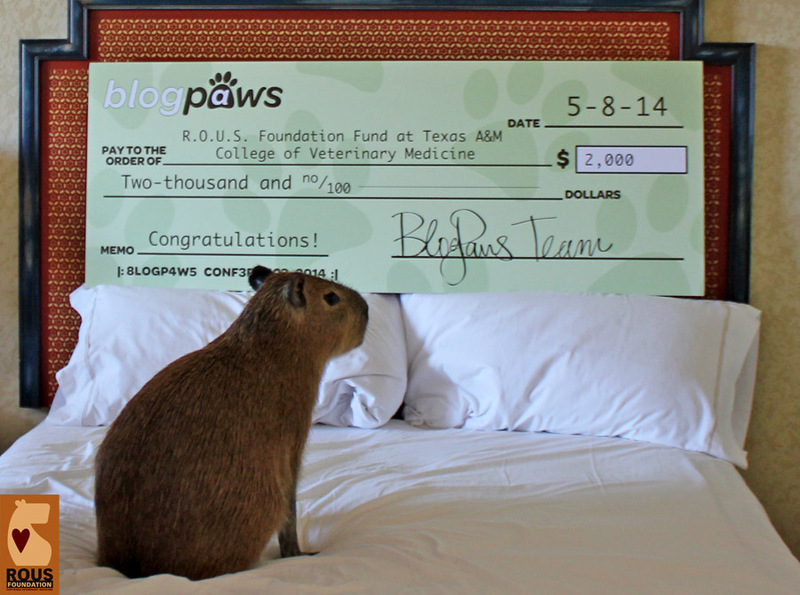 She even accepted this $2,000 donation to the ROUS Foundation from the BlogPaws organization. 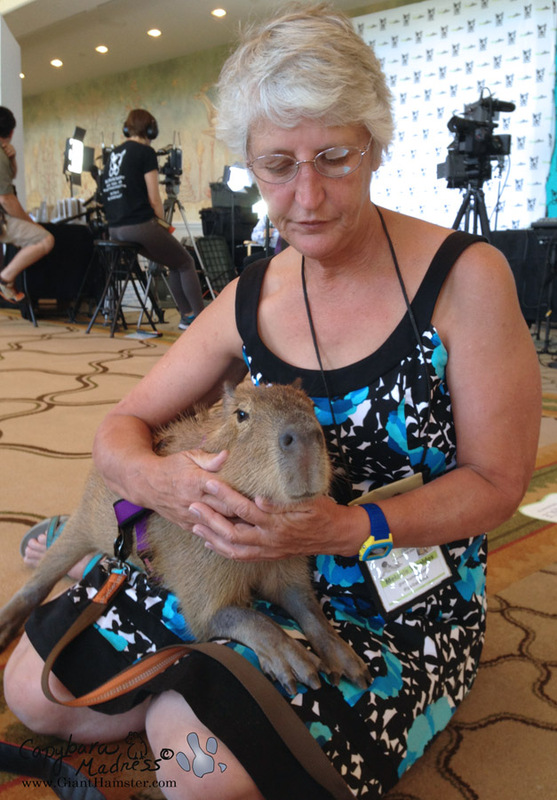 Attending a conference with lots of dogs in a big hotel far from home has got to be scary for a young capybara, but Mia took everything in stride. 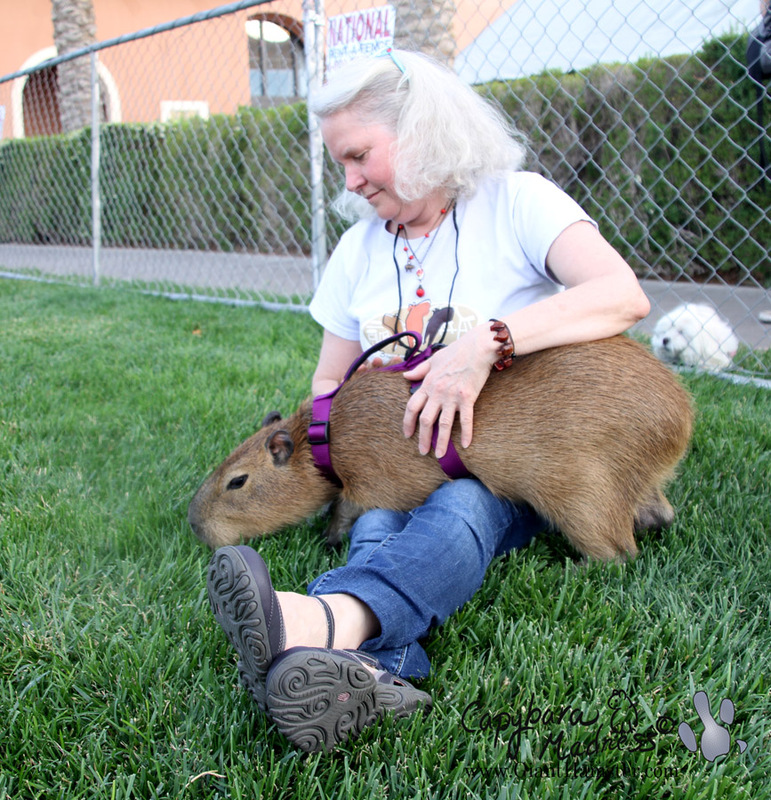 In the photo above you can see her cuddling with her owner, Georgianna Davisson while Becky Wilson of the Metropolitan Guinea Pig Rescue in Washington DC ooks on enviously. 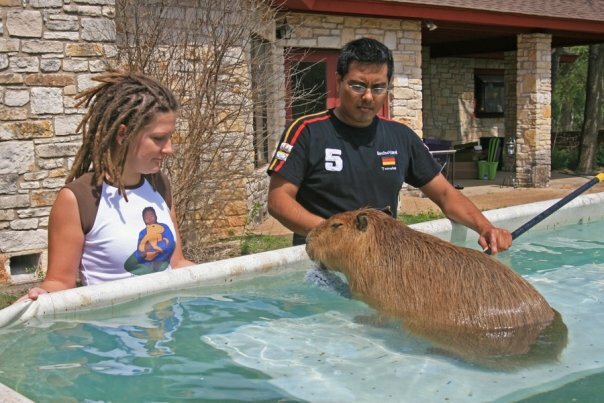 You’re probably wondering what kind of hotel would host a conference full of dogs, cats, ferrets, capybaras and other assorted animals? A pretty nice one, as you can see from the photo above. 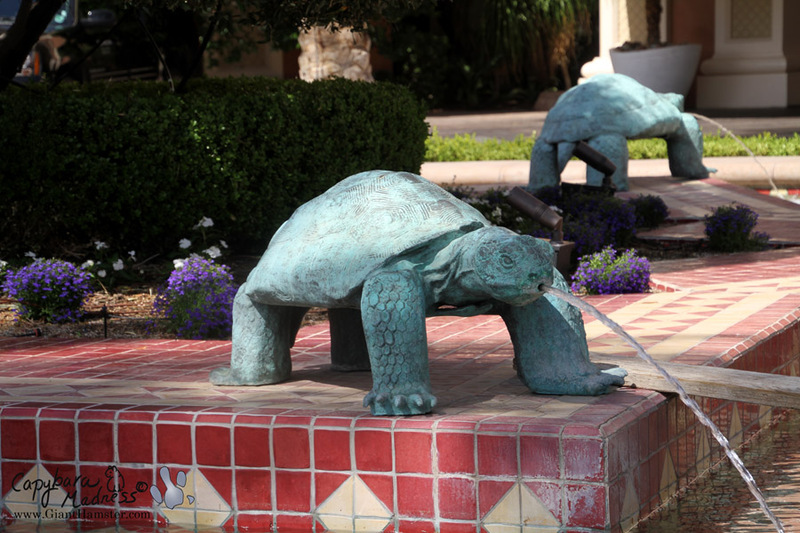 Maybe they were predisposed to be pet-friendly because they have a very nice fountain featuring several large turtle statues right in front of the hotel. 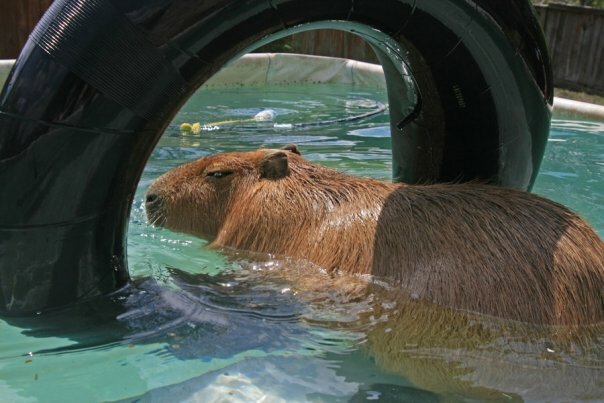 Sadly, there were no live turtles at the conference. Maybe I should have brought Leopolda. 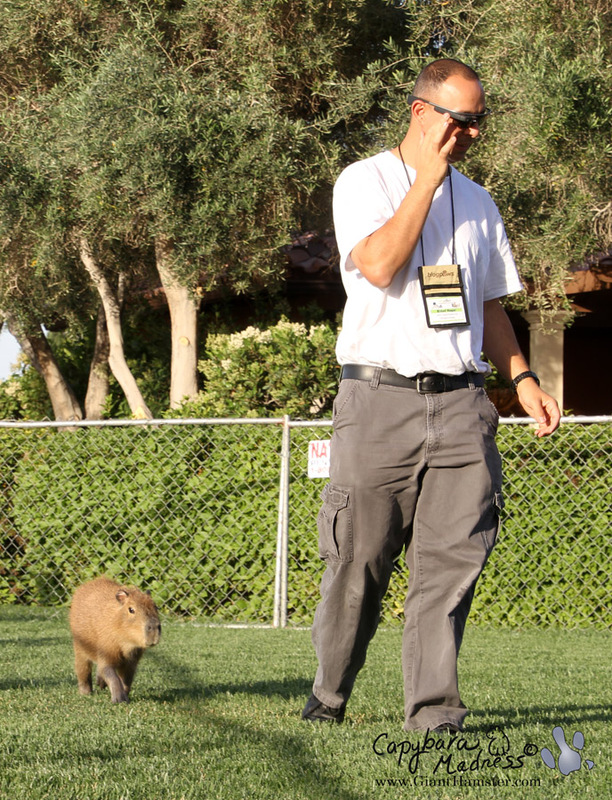 It’s not easy being a capybara at a conference full of pet people…and their dogs. 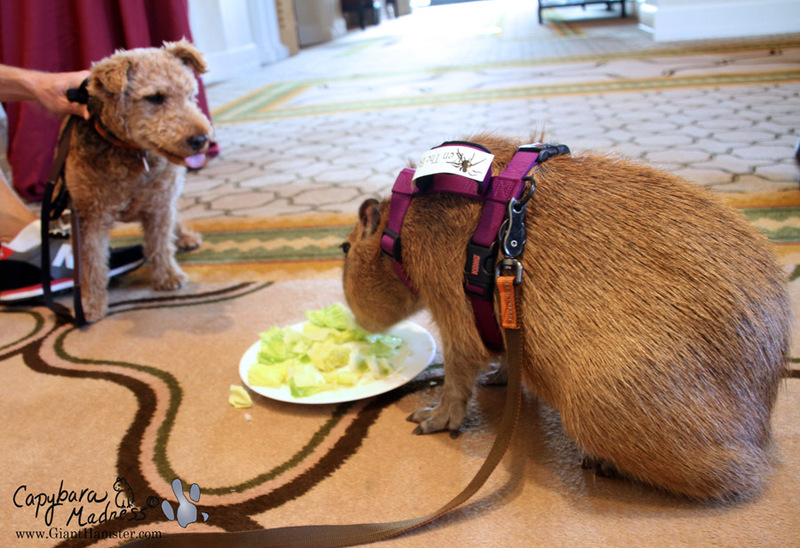 Poor little Mia had to eat lettuce from a plate with a dog (admittedly a cute dog) watching her. 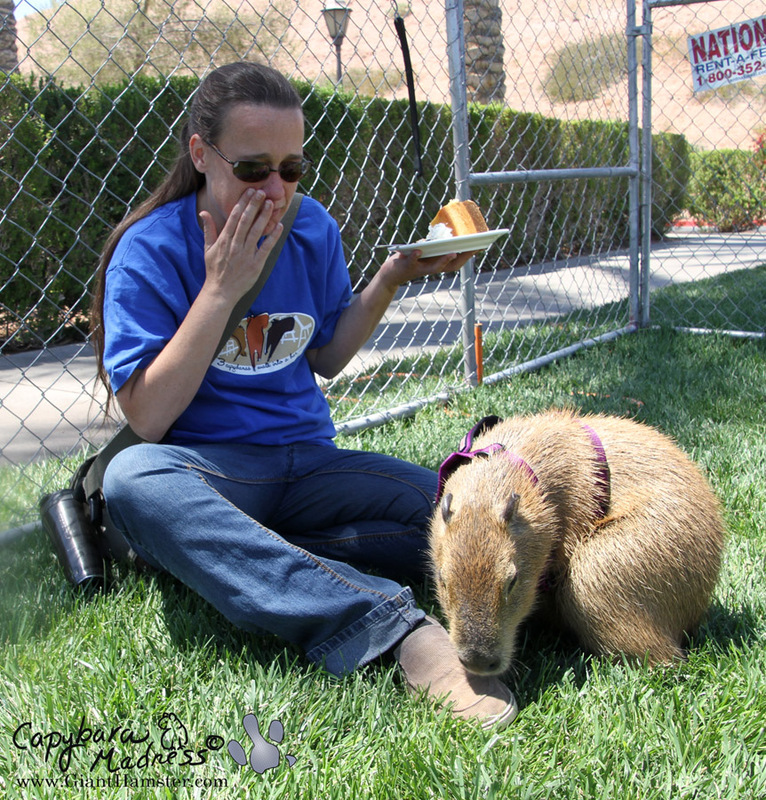 Maybe chewing on her owner’s shoe while she tried to eat lunch made up for some of the inconveniences Mia experienced. But surely lying across Stacy Winnick’s lap to get to the grass on the other side couldn’t have been very comfortable for either of them! On the other hand, both Mia and I look pretty happy to have her on my lap. Okay, maybe I look happy and Mia looks tolerant, but I’ll take what I can get. Speaking of being tolerant, Mia was even nice to this guy wearing Google Glass. 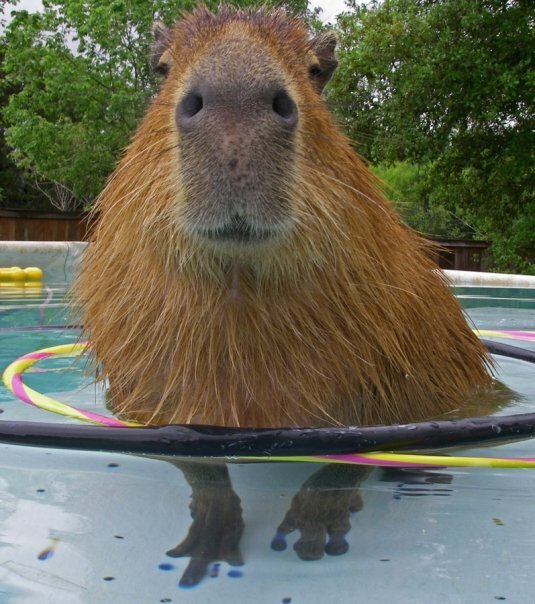 Most capybaras can’t take that much nerdiness all in one package. Maybe Mia had gotten used to the special prisms I have in my glasses to help with my hemianopsia and just thought this guy was also brain damaged. She could have been right. The guy explained that he could take a photo just by blinking his eye. I wonder what he was taking a photo of at this instant since Mia is behind him. Maybe he’s scrolling through his camera roll. 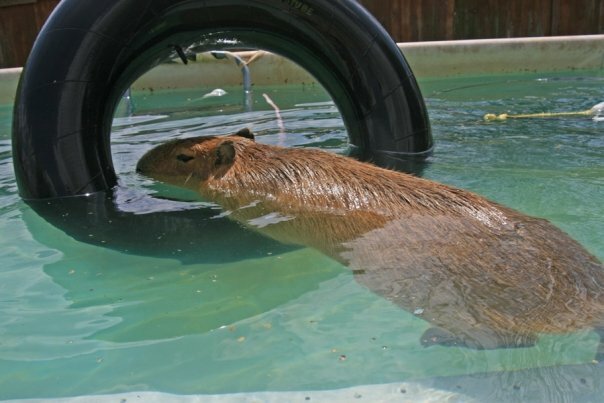 Looks totally convenient. Still, Mia could not help being cute, even for him. 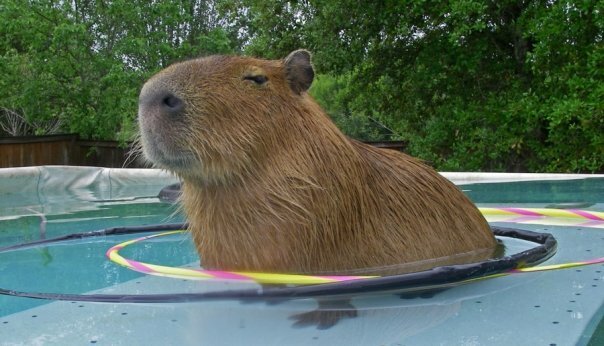 Is he taking a photo or does he always squint like that? I think I am going to have to stop this post here and finish it in a Part 2. There’s a lot more to cover but this is already getting long. More to come in a few days! 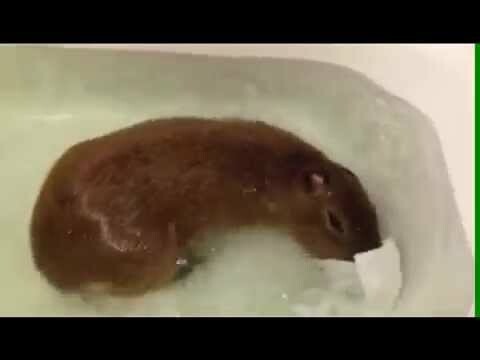 I’ll leave you with a cute video of Mia taking a bath in the tub of our hotel room. Great video! 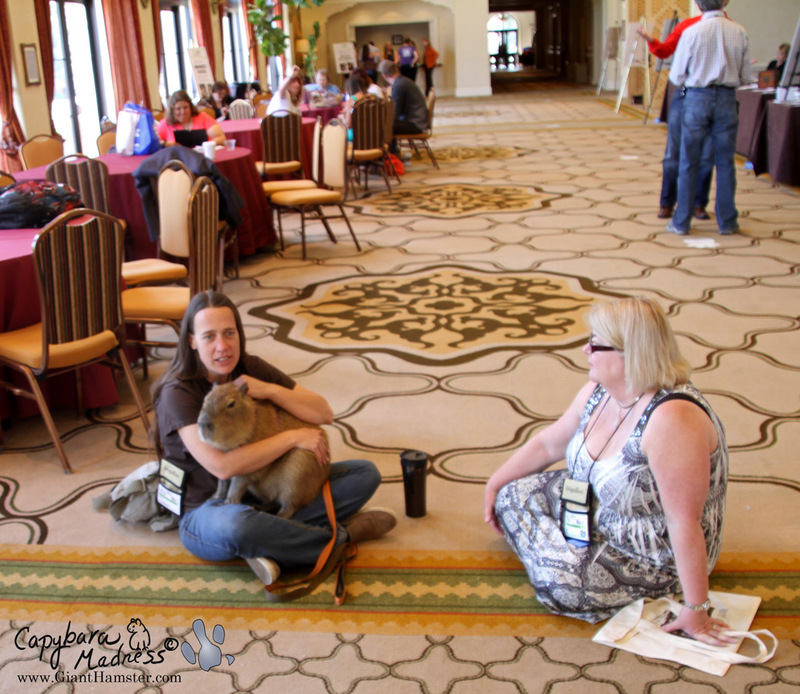 It was so wonderful seeing Mia at the conference. 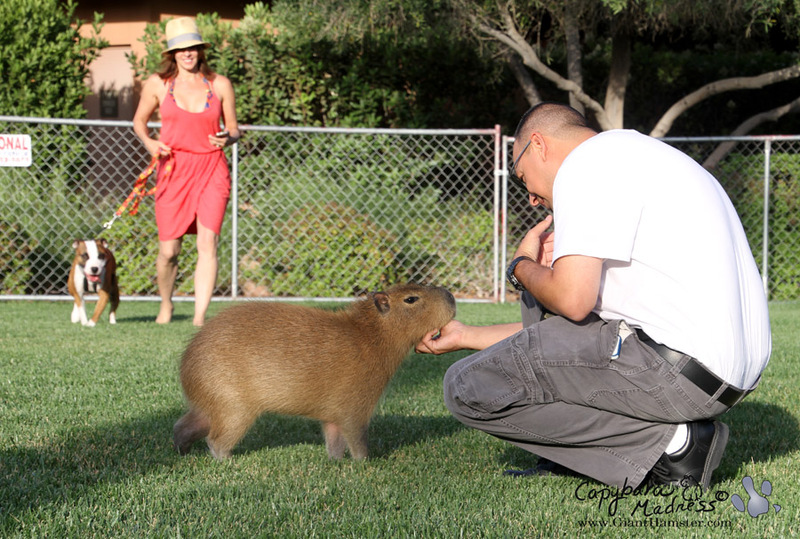 Mia is a great capybassador! Mia is beautiful! So petite. I couldn’t help laughing out loud when I saw her find the wash cloth and play with it. 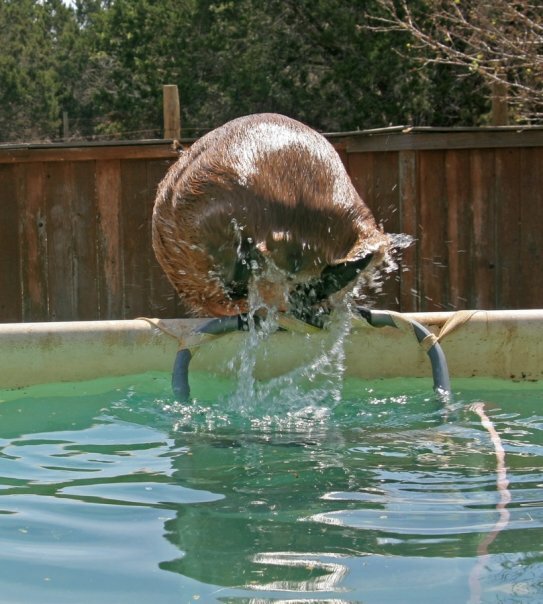 What a swimmer she is. Thanks for sharing this. Mia is so adorable. Did I see correctly that she likes to roll like Gari? You are GARIBALDI`s niece ! 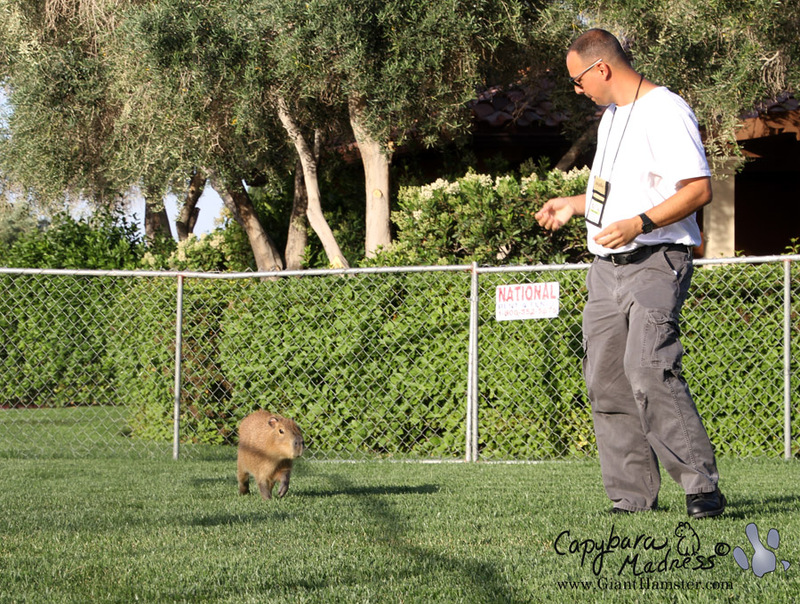 GARIBALDI has been your Uncle !! 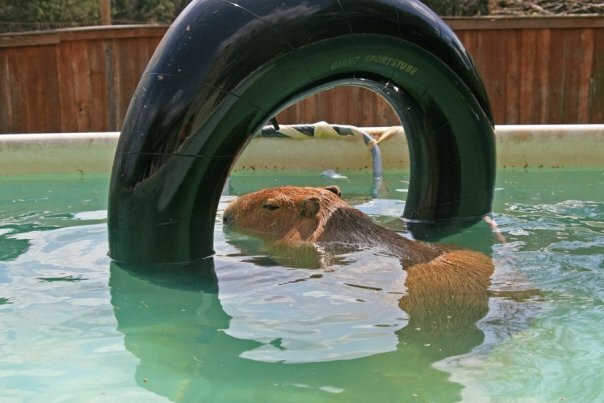 capybara-“body-care” the Hotel bath tube…!!! 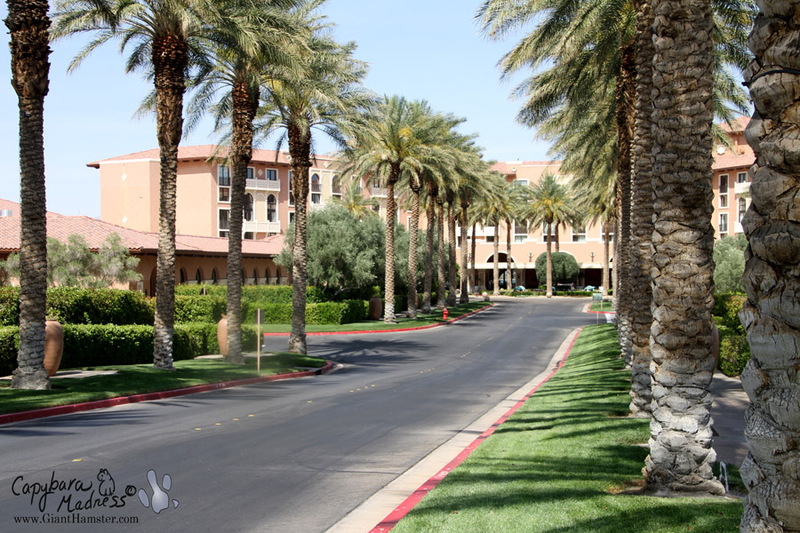 Loved the photos and the blog. Thanks for taking the time to put it together. Gari’s niece… what a sweetheart!!!! Unless I miss my guess, Google Glass Guy is Eldad Hagar of Hope For Paws rescue. Thank you so much for sharing! 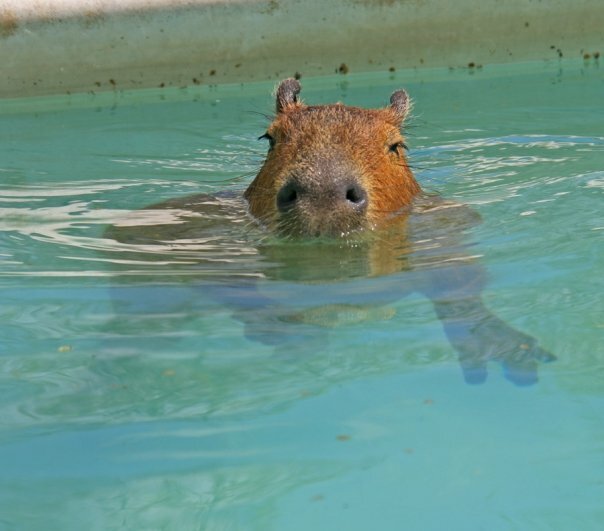 I love your writing style too…..Mia’s bath time was adorable.